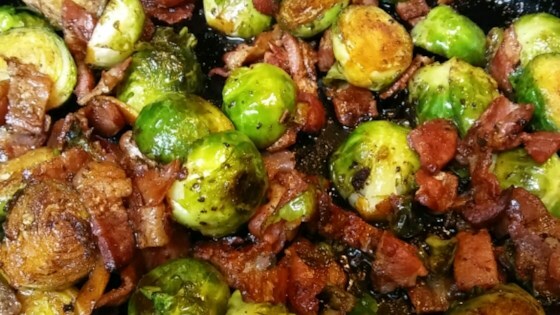 "Brussels sprouts with bacon and garlic are skillet-braised until tender and delicious." Place bacon in a large skillet over medium-low heat; cook until just crisp, about 10 minutes. Transfer bacon to a paper towel-lined plate, reserving bacon grease in skillet. Increase heat to medium-high under skillet; saute Brussels sprouts in the bacon grease until lightly browned, 2 to 3 minutes. Add garlic to Brussels sprouts; saute until garlic is fragrant, 1 to 2 minutes. Pour chicken stock over Brussels sprouts mixture and cover skillet with a lid; simmer until Brussels sprouts are bright green, 4 to 5 minutes. Remove lid and continue simmering until liquid is evaporated and sprouts are tender, about 5 more minutes. Remove skillet from heat and stir bacon, butter, vinegar, salt, and pepper into Brussels sprouts mixture until butter is melted. My husband doesn't like brussel sprouts but he absoultely loved these. This was good and glad I tried it. Followed the recipe except for Step 2. I just browned the Brussels sprouts and garlic in the oven instead of sauteing them on top of the stove. Thanks Kyle! This was really good. I didn't use all the bacon grease because it seemed like too much. My husband said they tasted like something you get at a restaurant. Will definitely make again!